We are lucky to have nettle all around us here in the Sequoia National Forest, for nearly nine months a year at various elevations, giving us a great chance to nourish ourselves for the cost of fresh air, some clipping, and steeping or cooking. We rely on a frozen nettle stash through the year for our nettle soups but when it is fresh and right outside our doors, a more simple tea ritual is also in order. My son Frederick suffers from seasonal allergies and finds great relief in nettle. (You can see a compelling before-and-after photo here.) In fact, nettle soup is the only “green” he is convinced to eat, primarily because he relief is so noticeable. Flavor-wise, nettle tea is quite earthy. It is not a tea I reach for when I am looking for flavor. In fact, I am inclined to throw some other flavorful mints in along with it. It is also complementary with citrus juices. We still have great access to local citrus in March here in California as the nettle arrives, making it a great combination for us. In our household, we brew up strong nettle infusions and mix them with fresh citrus juices for the boys. I tend to swig them down myself, sometimes diluted with water, sometimes heated with honey added. What are the benefits of nettle tea (Urtica dioica)? What are the side effects and risks of nettle tea (Urtica dioica)? Because nettle leaf does have potential medicinal qualities, it’s good to note contraindications. James A. Duke in The Handbook of Medicinal Herbs cautions against consuming nettle leaf if you are retaining fluid related to cardiac or renal activity. Nettle leaf is sometimes used to treat edema (fluid retention), so it is important to know the cause of your edema before proceeding with nettle infusions and teas. Fresh nettle tea can be as simple as pouring a cup of boiling water over a sprig of nettle and letting it steep, covered, for ten minutes. That may a good way to try nettle tea for the first time, just to see if you like it. For a larger batch, fill a small sauce pan with fresh nettle and cover with about a quart of boiling water. I don’t overly stuff the saucepans with nettle, but you could for a much stronger infusion. Of course, this recipe scales up just as high as you want to go but I only keep the infusion in the refrigerator for a few days making a quart a good size for us. As a pro tip, when we have massive harvests in which we freeze the leaves for soup, we make strong infusions out of the stems and freeze it for off-season. 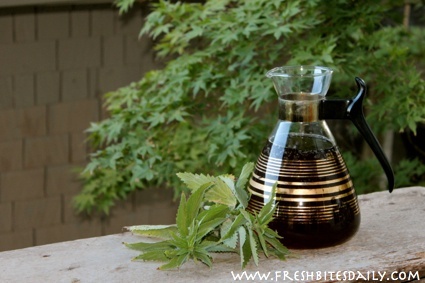 If you are just getting started and want to make a single serving beverage or you simply plan to brew your tea fresh each time, you can make a simple cup of nettle tea using dried nettle leaf, measure about one teaspoon of dried nettle to one cup of boiling water. Pour one cup of boiling water over one teaspoon of nettle leaf. 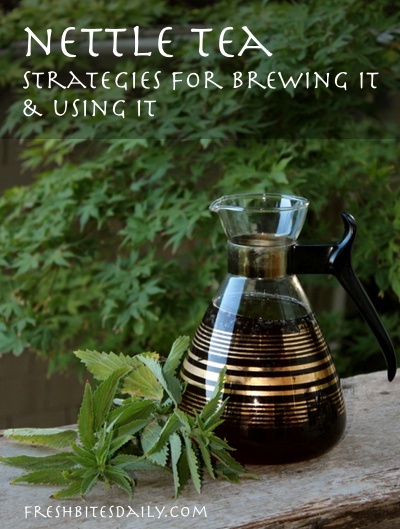 Learn more from my own mother about brewing nettle tea in the video below. 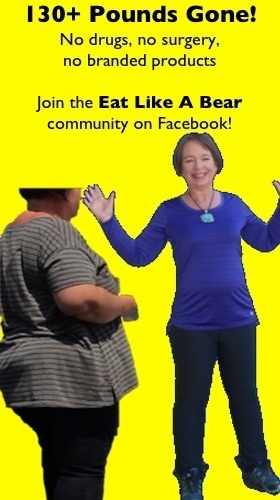 She has well over forty years of experience with herbs.